The Six Fat Dutchmen from New Ulm, Minnesota with 24 Hits! Decades ago, the Six Fat Dutchmen were known as the nation’s Number 1 Polka Band. Here is the Six Fat Dutchmen with 24 Classic Hits! 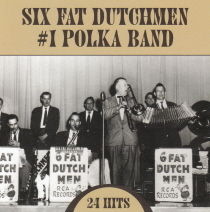 Check out this CD today with International Polka Music Hall of Fame® Harold Loeffelmacher and the 6 Fat Dutchmen!